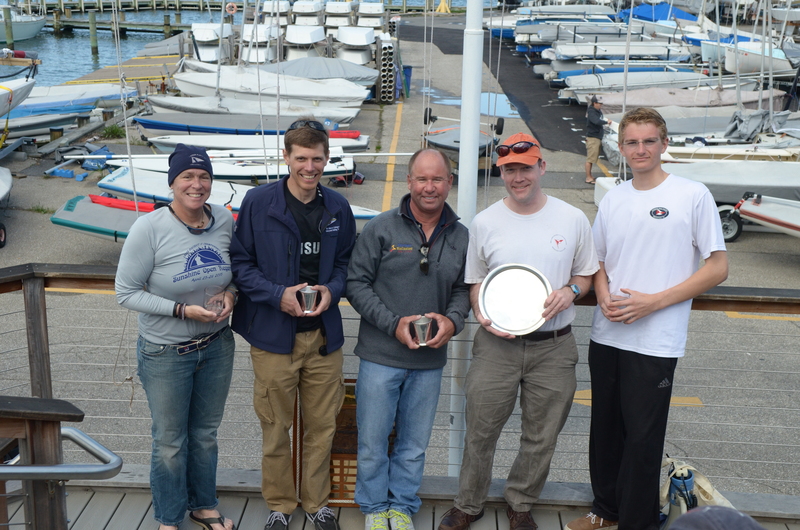 The District 11 Championship was held at Severn Sailing Association (SSA) in Annapolis, Maryland this year, in conjunction with their annual Sunshine Open Regatta. Conditions were fairly typical for this early season regatta with intermittent rain and breezy conditions forecast for Saturday and sunshine with diminishing winds for Sunday. Thirty nine sailors were registered for the event, twenty seven full rigs and twelve radials. One of the best events to kick off the east coast sailing season, the Sunshine Open is a long standing regatta dating back to the 70’s when the Laser was first introduced by Bruce Kirby. Saturday began with intermittent rain and a strong breeze out of the north northwest. Twelve to fourteen knots of wind with overcast skies and temps in the 60’s greeted the sailors as they sailed out to the course in Whitehall Bay, just below the Chesapeake Bay Bridge. Strong outgoing current and shifty conditions kept most of the fleet on the left of the course in the early races. The first day saw Leo Boucher, an up and coming Junior sailor from Severn Sailing Association, battling it out with a former District 11 Champion, James Jacob, for first in the Full Rig Fleet. Conditions were challenging, with the strong current and the intermittent swells from passing freighters creating big waves across the course, and the wind driven swells adding to the mix. Saturday ended with James Jacob in first, Leo Boucher close behind and Scott Williamson in third. The Radial Fleet had Kim Couranz in first, Jaques Kerrest in second and Dorian Haldeman in third. As the sailors made their way back to SSA the sun came out and treated all to a beautiful sunset, with the Naval Academy and the Maryland Statehouse in the background. A dinner of Maryland crab cakes and a great local band capped off a fun evening. Sunday dawned bright and cool with better than forecast breeze promising another great day on the water. The ten knot breeze that greeted the sailors on the way out to the course soon began to waver and go right. After two challenging races with shifty conditions in a dying breeze Leo Boucher came through with two bullets (1-1-2-1-1) to capture first place in the Full Rig Fleet, followed by James Jacob (2-2-1-1-3) in second and Eric Reitinger, from Brant Beach, in third. Mike Russom (previous District 11 Champion) and Scott Williamson filled in at fourth and fifth place. District 11 Champion, Leo Boucher was also the First Junior sailor and June Rose Futcher was the First Woman finisher in the Full Rig Fleet. In the Radial Fleet, three Severn Sailing Association members took top honors, Kim Couranz (1-1-1-1-2) finished in first with Dorian Haldeman (2-4-2-2-6) in second and Bill Lawson in third place. Susan Taylor and Jacques Kerrest, both of Severn Sailing, rounded out the top five in fourth and fifth respectively. Kim also took top honors as the First Woman in the Radial Fleet. All in all it was a great event with competitors from up and down the east coast attending and many sailors returning year after year. The Sunshine Open Regatta is coming up fast. This regatta is also the District 11 Championship and the first regatta for SSA with the new Laser sails. Registration is up on the severnsailing.org website and this coming Friday the 15th is not only the Tax deadline, but the deadline to avoid the late registration fee. The reason I do this is so I can have a good handle on T-shirts and dinners. So, make sure to register and pay before the 15th. We have a great party lined up for Saturday night with fine Chesapeake Bay Crab Cakes for dinner, a great band and a keg. What better way to kick off the season? We had a great Frostbite season this winter. One of the best turnouts I’ve seen. I still have a few Frostbite glasses to pass out to those of you who qualified by sailing in at least half of the days. I know who you are and I will be down at SSA this Saturday celebrating opening day. I’ll have the Frostbite glasses with me so track me down and get yours. It still felt a bit like frostbiting – but make no mistake – it’s spring and Severn Sailing Association held their Sunshine Open that doubled as the District 11 Championship. 28 Standards and 16 Radials set out to do 4 races in cloudy conditions with temperatures in the 60s. Many sailors elected to wear their drysuits. The forecast for Saturday was pretty dim – but with the RC out on the water seeing it fill in – the sailors were sent out pretty much on time where they would have 6-10 knots throughout the day. Winning races on the first day in the standard fleet were Luke Shingledecker, Kevin Shockey (2) and John Shockey. The Radial fleet was tightly matched with Kim Couranz and Mike Schmidt trading races. Saturday evening the sailors were treated to great meal and most hung around until the band shut the place down later in the evening. Sunday morning the weather was a bit better with mostly sunny skies, a little warmer temperatures than Saturday and winds in the 8-11 range. Racing was postponed a bit while Saturday’s scores were straightened out and 2 more races were sailed. Congratulations to Luke Shingledecker winning his second Standard District Championship in a row. And congratulations to Mike Schmidt on winning his first Radial District Championship – Mike is the first sailor to have won both the Standard and Radial District Championship. The Sunshine Open, held at Severn Sailing Association in Annapolis, offered close to ideal conditions for this early season regatta. Thirty four boats were registered, 23 standard rigs and 11 radial rigs. Although conditions were light to nothing on the way out to the course the first day, the wind soon filled in to the forecasted 12-15 knots out of the northwest. The sun was shining but the water temperatures were still cool enough to warrant spray tops and even a dry suit or two. Competition was fierce in the standard fleet on Saturday with four points separating 1st and 3rd place after four races. At the end of the first day John MacCausland was leading the standard fleet with Mike Russom, Jonathan Phillips and Luke Shingledecker close behind. Kim Couranz led the radial fleet with Susan Taylor and Dorian Haldeman in second and third. On the way back to the dock both fleets were treated to 20+ knots with gusts exceeding 30. Timing is everything. Saturday evening the sailors enjoyed drinks and dinner on the deck overlooking the Naval Academy, Annapolis and the Chesapeake Bay. The Unified Jazz Ensemble provided cool jazz on the upper deck to round out a great evening. Sunday turned out just as beautiful with bright sunny skies and breeze in the low to mid-teens. The race committee got in three more races on Sunday for the standard fleet and two for the radials before the wind turned shifty and began to die. Final results did not change much from Saturday. In the standard fleet John MacCausland finished in first with 11 points through 6 races scored, Mike Russom was second with 15 points and Jonathan Phillips was third with 19 points. In the radial fleet Kim Couranz was first with 7 points through 5 races scored, Susan Taylor was second with 10 points and Dorian Haldeman was third with 15 points. Severn Sailing Association will be kicking off the season with the Sunshine Open this weekend on April 26-27. Time to get your boat scrubbed clean, gear dusted off and REGISTER! We are getting prepared for a great opening Laser Regatta at SSA. Real Food has worked up a great menu, they have an impressive selection of beers on tap, and we have engaged the Unified Jazz Ensemble, www.unifiedjazz.com, to provide entertainment on the upper deck after sailing on Saturday. The weather has been great lately and the long range forecast looks promising. Spring is here and it’s time to get back on the water. Results from Severn Sailing Association’s Sunshine Open Regatta are posted. John MacCausland from Cooper River Yacht Club was the winner in the 30-boat Standard Fleet while Janel Zarkowsky from SSYC won the 14-boat Radial fleet. The Standard fleet was the only fleet to get in one race in the light-air on Saturday. Both fleets sailed 5 races in better wind on Saturday.